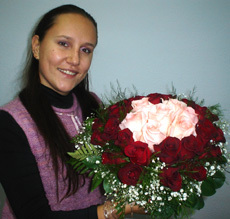 This page is specially designed to let you know how each bouquet looks in real life. 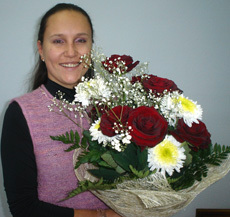 So, you may estimate the size, the colours and the shape of each floral arrangement. We hope that it helps you to make the right choice and make your shopping easy.В It's been updated on regular basis. So, you'll be able to see all arrangements presented in the common gallery. 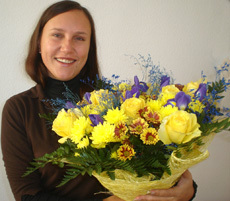 Festive basket of tender colours will be a great present for your beloved! 7 roses, 2 lilies, statica, greneery with floral elements. 4 Liliies,3 gerberas,5 chrysanthemum,5 ghypsophillas,ruskus,asparagus and greenery in a beautiful basket will make your beloved happy. 33 roses, greenery in a natural wrapping. This festive flower arrangement will bring you feelings of spring in the winter time. 10 chrysanthemum, ornitogallum, ghypericum, in a natural wrapping. Heart shaped pink and red roses will be a wonderful gift for ladies on special occasion and will fit any make up table. It'll stay long and will bring a wonderful aroma with each beginning of the day. 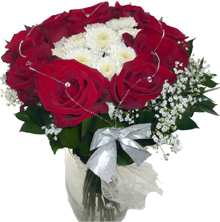 large arrangement - 25 red roses, 10 pink roses; medium arrangement 19 red roses, 7 pink roses; small arrangement 15 red roses and 5 pink roses. 9 yellow roses, 5 chrysanthemum, 7 irises, 3 limoniums, greenery in natural wrapping. 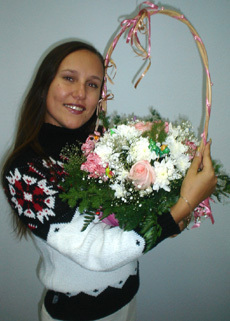 5 pink roses, 3 pink carnations, 5 white chrysanthemum, baby breath, greenery in a basket with ribbonds, small decorative toys.